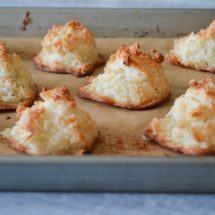 Mondays are probably the least loved day of the week, which is why I decided it was the perfect time to finally share one of my biscuit recipes. A little over one year ago, I perfected my buttermilk biscuit recipe. For years I’d been making Dorie Greenspan’s, and while I never fell out of love with it, it was time for this little bird to stretch her wings and go out on her own. The ingredients were pretty much the same—flour, baking powder, baking soda, sugar, salt, very cold butter, and buttermilk. The ratios and technique are what I tinkered with to make what I think are the fluffiest biscuits, ever. Less than a week ago, my whole biscuit making world was turned upside down. 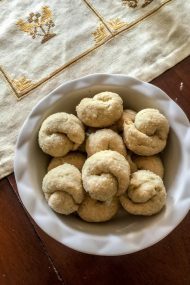 I came across an article with Nathalie Dupree, where she mentioned two ingredient biscuits being a good starting point for anyone curious about making them from scratch. 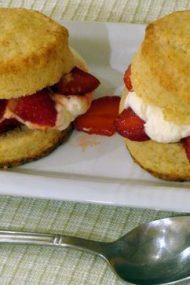 The ingredients are simply self-rising flour (White Lily is a staple in southern kitchens), and cream. The wheels started turning, but I was still skeptical. The biscuits in the photo weren’t fluffy, and light-looking, like the ones I pride myself on making. This gal knows my biscuits first-hand, and also knows a thing or two about food. Anyway, the premise of the two-ingredient biscuits gnawed at my mind, until I couldn’t contain myself any longer. My All-Purpose Baking Mix from Homemade with Love is very similar to self-rising flour, with the addition of a bit of sugar and baking soda. 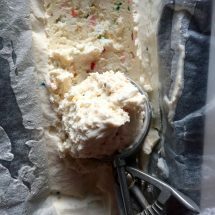 I had to give it a shot, and see if I could create two-ingredient biscuits using my own mix and cream. 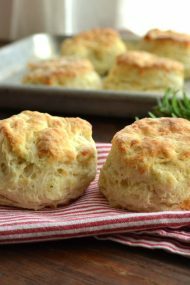 I used the recipe I had perfected for traditional biscuits as a starting point for the dry and liquid measurements, keeping in mind that Dupree said the dough for these biscuits needed to be very wet. I took that to mean a consistency similar to drop biscuits. That translated into doubling the amount of liquid in this recipe. 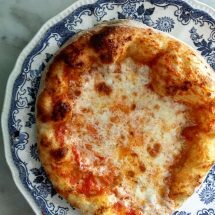 Once the dough looked right to me, I dumped it onto a floured counter, and this is where you need to be listening closely. Rather than just gently pressing out the dough as most recipes direct you to do, you want to take a puff pastry-making approach. This is the technique I hit upon last year in developing my buttermilk biscuit recipe. Dupree says folding over once or twice is what they recommend for beginners. I say go big, or go home. Literally. I repeat the process four to six times. 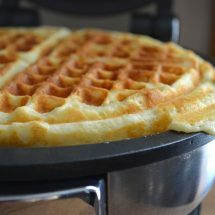 The key is to gently press the dough with your fingers, as you fold it into thirds, as described below. Biscuit dough should never be kneaded. As Dupree mentions, it’s better to think of it as manipulating the dough. My first batch went into the oven, and I think I held my breath, flicking on the light inside every minute or so to monitor their progress. My lips curled upward into an uncontrollable smile, as I watched them rise way beyond the biscuits that inspired me to make my own version. Feeling like it could’ve been a fluke, I proceeded to bake six dozen biscuits over the next three days. There’s no mistake here folks. 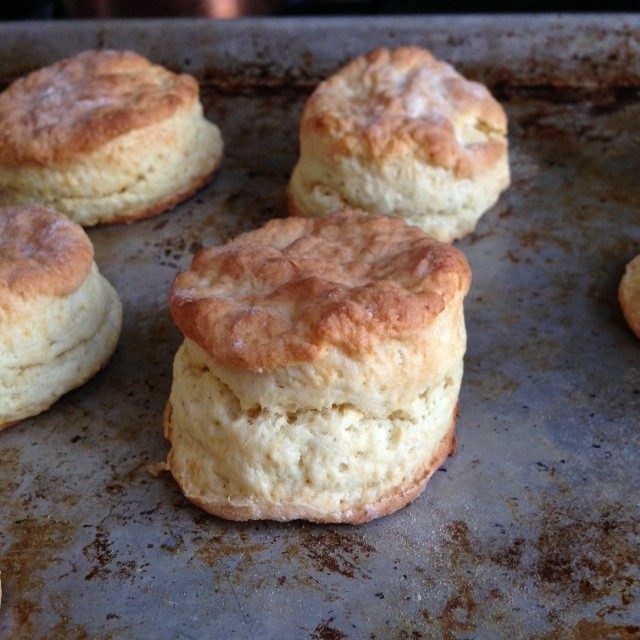 These are the easiest, flakiest, fluffiest biscuits you’ll ever make. 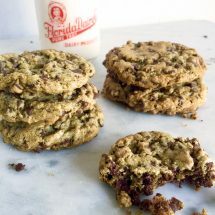 I feel like a proud mama, every time I create a new recipe using my All-Purpose Baking Mix. While we’re on the topic of Homemade with Love, can you believe it’s almost a year since it was published? 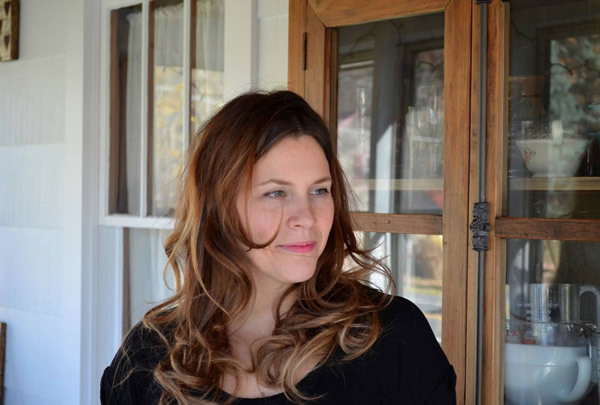 Stay tuned for a few fun giveaways late March, around the book’s first birthday. If you don’t have the book yet, now’s the time to pick it up. The giveaways will be based on recipes you’ve cooked from the book, hosted on Instagram and Pinterest, and include some of my must-have kitchen splurges plus a gift certificate to one of my favorite stores. In the meantime, go bake a batch of these biscuits. 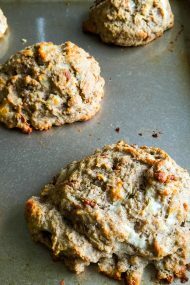 If your sweetie is a biscuit-loving fiend like me, these will be an easy, homemade breakfast for Friday. I’m even thinking of cutting some out in heart shapes for the kiddos. p.s. 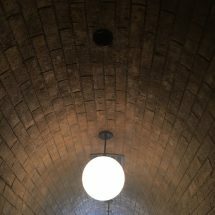 After writing this post, I found the interview where Dupree was talking about her two-ingredient biscuits. It was actually this interview on The Splendid Table. Turns out I read the transcript, but hadn’t listened to the interview itself. I hadn’t even seen Dupree’s recipe, but just took a peek at it. Our ratios seem to be close, but again out techniques differ (I don’t find the re-roll biscuits to be tough at all!). My biscuits also bake at a slightly lower temperature. Read the recipe, listen to the interview and see for yourself. Add the baking mix to a medium bowl. Pour in the cream, and stir using a wooden spoon, until combined. The mixture will be quite wet, and sticky—don’t worry. 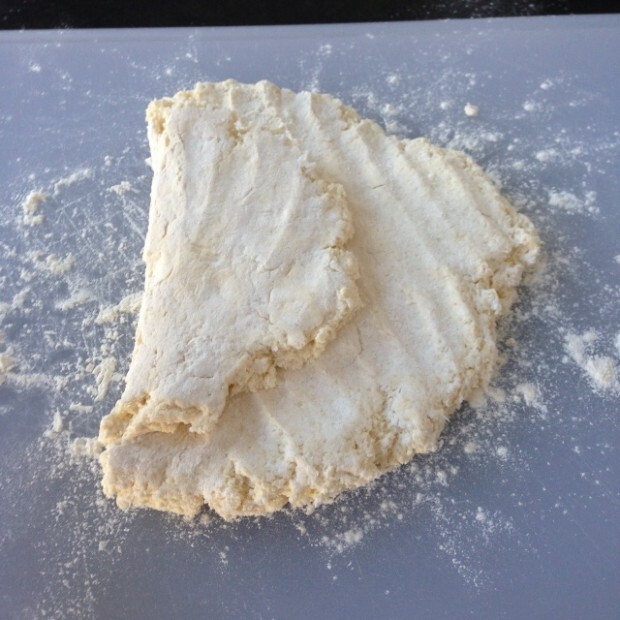 Scrape the dough out onto a lightly floured counter or board. 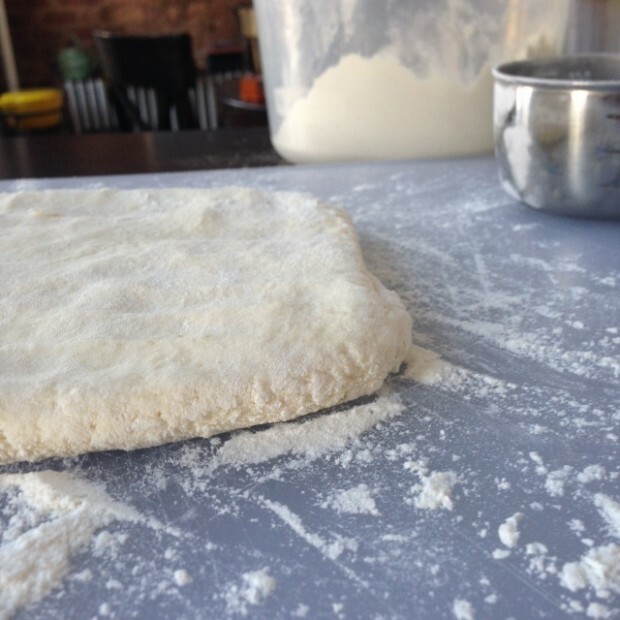 Using the tips of your fingers, gently press the dough into a 1/2-inch thick rectangle. 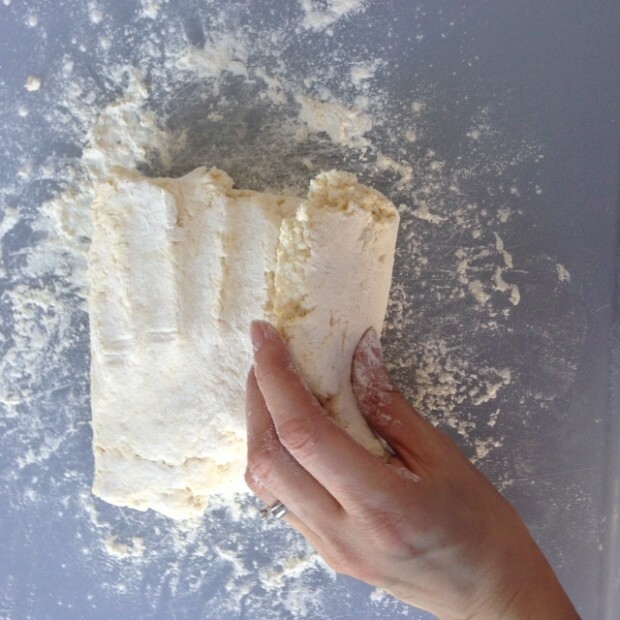 It doesn’t have to be a perfect rectangle, just be careful to only press lightly—do not knead the dough. Fold one third of the dough in towards the center. Fold the outer third of the dough in towards the center, laying it on top of the piece that has already been folded over. Gently lift the dough, and sprinkle more flour underneath, if needed, to ensure it doesn’t stick. Sprinkle a little more flour on top, too. Gently press the dough back down into a 1/2-inch thick rectangle. Repeat this process a few more times (I usually do it a total of four to six times). 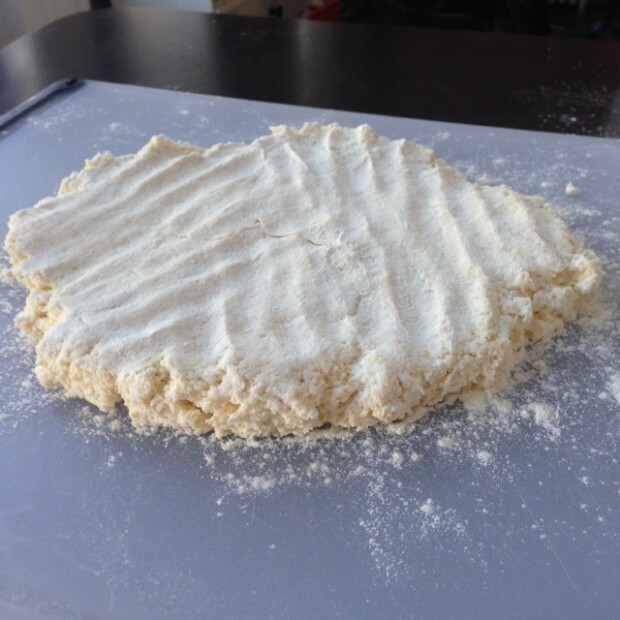 Dip a biscuit cutter, or the rim of a glass, into some flour (I use a 2 1/2-inch round cutter). Press it into the dough firmly to cut straight through to the bottom—do not twist the glass, or else the biscuit will not rise properly. Place the cut biscuits onto an ungreased baking sheet (a light colored one works best). Bake on the upper rack of the oven for 12 to 14 minutes, until golden on the tops and bottoms. Serve warm. Want to share this recipe? Please do so properly. 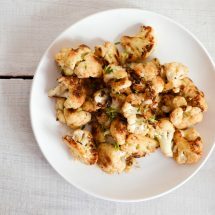 Unless you intend to rewrite the directions in your own words, the proper, and ethical way, to share this recipe is to provide a link back to the original post here for the full recipe. All images are property of In Jennie’s Kitchen, and may not be used without permission. This is exactly what I’ve been looking for. I’m off to make some right now. And yes, I know it’s 2:32 in the morning but some things just can’t wait. Thanks! 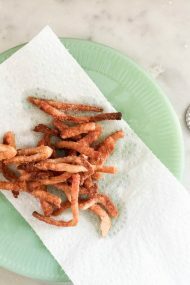 I don’t think I’m over exaggerating when I say that I think this recipe has changed my life. There are so many times that I crave homemade biscuits, but I’m not interested in digging out what feels like half of my baking cupboard. I’m so excited to try this recipe out!! 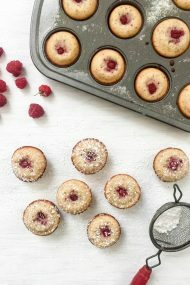 These look beautiful (and yummy). 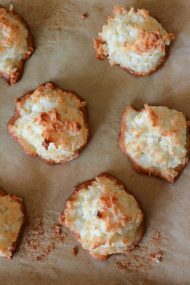 I have Nathalie Dupree’s book on biscuits, and she has another recipe in there that uses yogurt, which also makes really delicious biscuits. 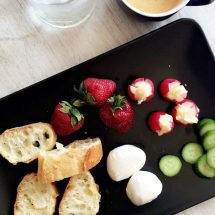 She also encourages us all to practice, practice, practice, since biscuits are the one food item that uses relatively simple, low-cost ingredients, so it doesn’t break the bank if something doesn’t work out. Thanks for sharing your version. I’ll be adding it to my biscuit rotation! Thanks for the recipe, Jennie! They look perfect! Have you ever frozen the unbaked biscuits and then baked them later? I really wanted these biscuits to be amazing I was so excited to make them but they did not turn out good. I’m confident that I followed the recipe to a T but they were horrible I’m afraid. JP’s Note: Paula, I’m sorry to hear, but would love to try and help you trouble shoot. It has been made by many people with success. Did you use my all-purpose baking mix (not all purpose flour)? It definitely will not rise with just regular flour. 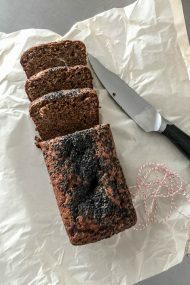 The rising and cooking problems are indicators that you may not have had a proper leavening agent (the baking mix has baking powder in it), the baking powder may have been too old, and lost it’s strength, and it sounds like your oven is not working at the proper temperature. Do you have an oven thermometer to determine your oven’s accuracy? These were SOOOO good! 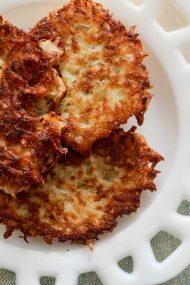 I made them this past weekend for our family breakfast and they were such a winner! Thanks so much for sharing!